As Jon Favreau continues work on his next sashay through the Disney vault with the live-action revival of The Lion King, it looks like the director might be joined by two very funny people. 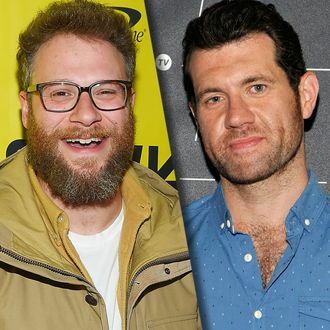 According to the Wrap and The Hollywood Reporter, Seth Rogen and Billy Eichner are in talks to join the voice cast as Pumbaa and Timon, respectively. If talks go as planned, they’ll join Donald Glover (Simba) and James Earl Jones (reprising his role as Mufasa) in what is shaping up to be a cast with lots of Lion King experience. After all, Rogen’s “Crosswalk the Musical” staging of The Lion King with James Corden, and Billy Eichner’s experience as a bartender for The Lion King on Broadway totally count, right?